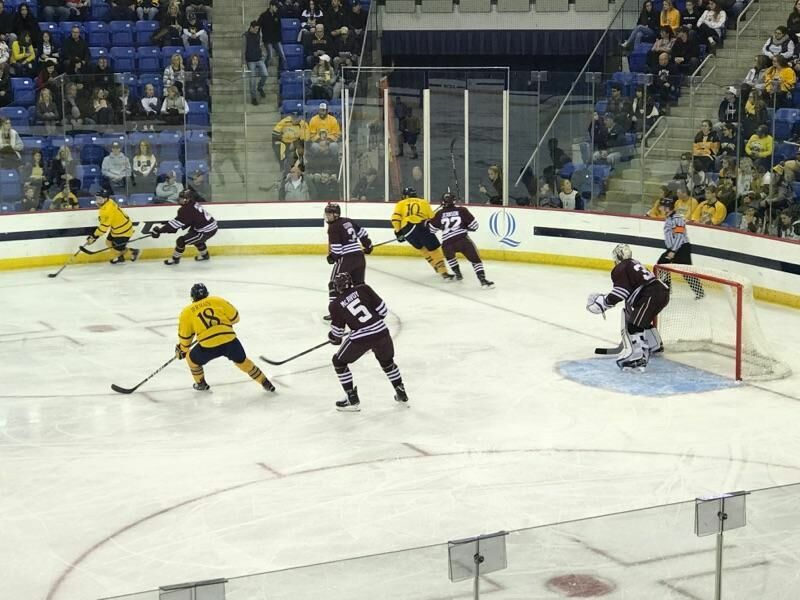 It was a lost weekend for the #11/12 Quinnipiac Bobcats men's ice hockey team. 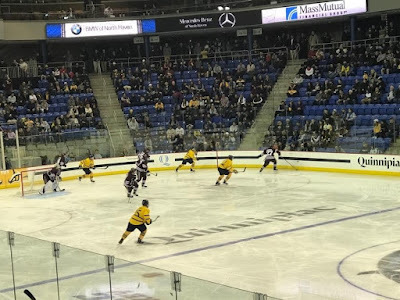 A night after falling 2-1 to Cornell, Quinnipiac got off to a poor start in the first period and never recovered resulting in a 4-1 loss to the Colgate Raiders. For the first time since Quinnipiac entered the ECAC back in 2005, the program has started conference play 0-2. Not only has this team begun conference play with consecutive losses, they have an offense that is missing in action. The Bobcats have scored only 17 goals in 7 games played, a stark contrast to prior Quinnipiac teams along with a power play that is struggling mightily. What was supposed to be an exciting night with alumni weekend in full swing and the renaming of the arena to the Frank Perrotti, Jr. Arena turned into a nightmare when Colgate's Adam Dauda scored on the power play a little more than 12 minutes into the first period. Not even two minutes later, Colgate struck again on what turned out to be the game winning goal by John Snodgrass. Quinnipiac made a change in the second period moving Brogan Rafferty to forward and Luke Shiplo back to defense. They seemed to get back into the game when Kārlis Čukste scored from the half wall to cut the deficit in half. Quinnipiac played well for the better part of the second period pounding 17 shots on goal but suffered a back breaking goal with .3 seconds left on the clock. Colgate's Mike Panowyk blocked a shot and raced up the ice on a breakaway before burying one past Shortridge. It is the second time this season that Quinnipiac gave up a back breaking goal at the end of the second period. They previously gave one up on the Friday night game against Northeastern which they eventually won 6-4. Quinnipiac had its chances in the third period with two power plays that resulted in nothing. The Bobcats were on their heels for much of this game and looked out of sync. Mike Panowyk put the game on ice for Colgate with his second breakaway goal of the game with less than four minutes to play. After a week off it is surprising how poorly Quinnipiac played on home ice being out classed both nights. 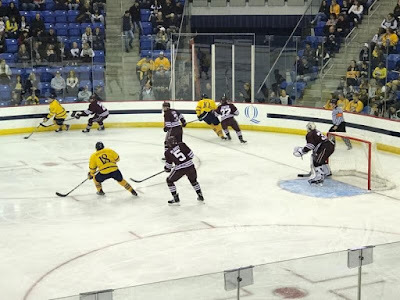 You have to give Colgate a ton of credit as they took Quinnipiac out of its game pretty much for the entire night and capitalized on their opportunities and made the Bobcats pay for their mistakes. 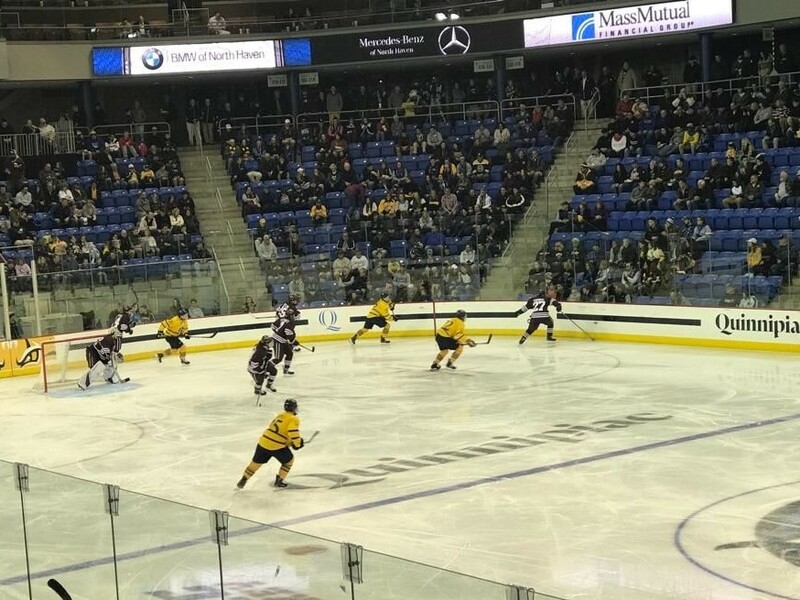 For Quinnipiac it looks like they need to get back to the drawing board and do something to shake up an offense that has been missing for pretty much the entire season. Andrew Shortridge finished with 24 saves after getting his first back to back starts of the season. Colton Point was strong again for Colgate with 33 saves. Quinnipiac falls to 3-3-1 (0-2 ECAC) while Colgate improves to 4-2-4 (1-0-1 ECAC). The Bobcats now head out on the road to the New York capital region to take on RPI and Union next weekend.